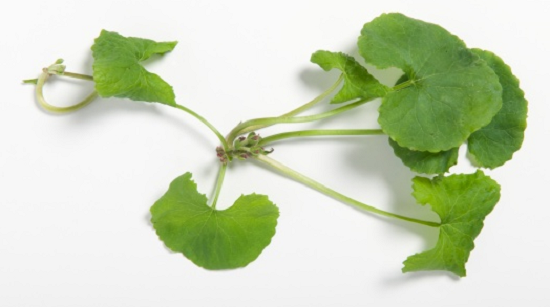 The herb Manduka Parni (Centella Asiatica) or gotu kola also known as Indian pennywort is a small herb which grows in tropical swampy areas. This herb is known as gotu kola in Hindi. It is an annual herb with slender, green soft stalk. The roots consist of rhizomes and root hairs. The plants are connected to each other. The leaves are round, smooth and reddish green in colour. The flowers are small and pinkish red in colour. They occur in bunches. The plant matures in three months. The herb gotukola boosts memory and grasping power. It is used as brain tonic . Its benefits in conditions like Alzheimer's disease ,anxiety and depression are also appreciated. Mandooka parni increases body fire or agni. Hence its preparations are used in Indigestion, loss of appetite, conditions like Irritable Bowel syndrome and amoebiasis. This herb effectively helps to reduce increased blood pressure and edema which arises due to increased blood pressure. It normalizes vitiation of blood due to pitta. The accumulated bronchial secretions or kapha gets easily expectorated when this herb is used in respiratory conditions like bronchitis and asthma.It is very useful in inflammation of vocal chords. The usage of this herb helps to reduce frequency of urination. It helps in diabetes. Regular use of this herb helps in slowing down aging process. Its anti aging properties help to rejuvenate body tissues and boosts body immunity. Lactating mothers can reap the benefits of this herb, as it increases milk secretion and also purifies it.